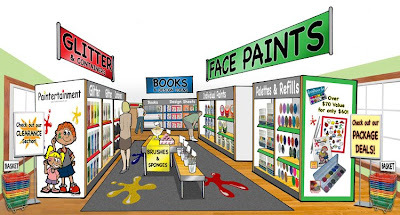 Grand Opening of the NEW Paintertainment Virtual Store! 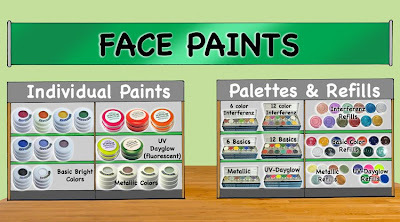 Today is the grand opening of Paintertainment's new virtual store! I have just completed the totally new design, construction, and merchandising of our store. When you go to my new shopping page, you will see a store (above), just like you had stepped into an actual retail location. However, unlike most retail locations, this store is open 24 hours a day, and you don't have to burn any gas driving here! Glance around the store overview to get your bearings, and click once you decide which aisle you'd like a closer look at. You can choose from Glitter & Containers, Books & Design Sheets, Brushes & Sponges, and Face Paints. Or, click on the special promotional signage to see our Clearance Section and Package Deals! Once you click on an aisle, you will see a closer view of the shelves (above), where you can peruse the different products available and click on them for more information and to add them to your shopping cart. I plan to incorporate more intuitive features into my virtual store in the near future as I continue to fine-tune your shopping experience. Feel free to comment here or email me if you have any comments/suggestions, or if you come across any links that are not working properly! Thanks for visiting...please come again soon! Kryolan Paints and Glitter on Sale 10% off! I am happy to say that I have just updated my website with a new CLEARANCE ITEM SECTION! I will be using this area of the site to sell items that I will no longer carry or would like to discount for other reasons. Be sure to check it out for the latest deals! Right now I have some nice pastel purple paint up there for 10% off, simply because I accidentally ordered the wrong color. It is nice, new paint, but is not the purple that I regularly carry and just don't want to add it to my inventory. 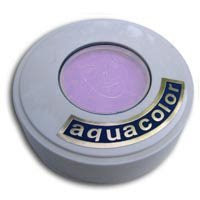 You can also find that I have all of my Kryolan glitters on sale for 10% off! I have decided only to carry the Stampendous glitters, so now is the time to get these at a discount. First come, first serve... get 'em before they are gone! !